Thanks so much for checking out my teaching blog! I'm so excited to be a part of the blogging community! I am a kindergarten teacher and I love creating fun and engaging lessons for my students! I designed my blog myself and I have seriously looked at tons of online webpages, videos, blogs, etc. to help me along the way. It has definitely been a learning experience and I have changed it and updated it MANY times! For this blog, I figured that since I love teaching and baking, why not combine the two - Recipe for Teaching!! I plan to post the ideas that I am using in my kindergarten classroom on this blog. I may also post about some delicious recipes! Here are a few shout-outs to some awesome clipart and font artists that I used to help create my logos, headers, sidebar titles, etc.! Hi, my name is Heather and I LOVE Educlips clipart! I designed my blog logo using her clipart! You should follow her store on Teachers Pay Teachers for sure because she offers new clipart sets at 50% for the first 48 hours they are posted! Do you love fonts?!?! 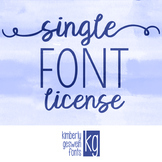 Kimberly Geswein has some of the BEST fonts! I used her fonts on my blog. They are so fun! The black and white polka dot background on my blog comes from Sonya DeHart. I love her black and white digital paper set! I can't wait to share my teaching ideas with you and hope that you are able to use the ideas in your classroom! Don't forget to follow me on Teachers Pay Teachers and Social Media for my latest updates and products! Just click the links to follow along!